COLOR WOODCUT ON PAPER, 49 1/2" BY 36 3/8"
My acquisition of this work was complete serendipity. When my brother Ward (visiting from Baltimore) and I attended the wedding of a friend of ours in Charlotte in June, there was an interval between the wedding reception and a party to be held at the bride's parents' house. Since Ward and I didn't want to travel all the way back to my place to change, I asked him if he wouldn't mind coming to an art gallery that I knew about that wasn't far from the church. He agreed, so we went. When we arrived, the current show was called Facades, and featured works by Robert Cottingham, an artist of whom I had not previously been aware. Ward and I had a great conversation with Jerald Melberg, owner of the gallery and previously curator of the Mint Museum in Charlotte. While we discussed various art-related subjects, I found myself very attracted to some of Cottingham's works; in particular, this one. Two days later, after doing some independent research on Cottingham, I contacted the gallery and arranged to purchase this work. This work is based on a photograph of a theatre in Los Angeles called the State Theatre. 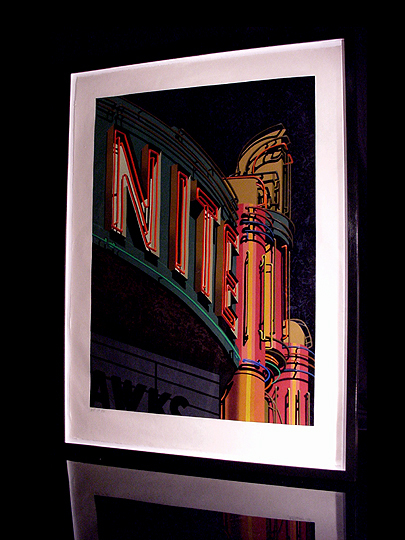 When making this print, Cottingham changed the name of the theater to the phonetically spelled "NITE", a popular word in American culture. The name of the movie being shown in the theater is incomplete, but it ends in "AWKS". Cottingham has said that the combination of these two words ("NITE" + "AWKS") creates a "discrete homage" to Edward Hopper's famous work Nighthawks. Nite is a print (which is different from a reproduction; this is an original work of art made by the artist himself using woodblocks, paint, and a press), and no more of these prints are being made. The label "AP" in the lower-left corner of this work indicates that it was originally created for the artist's use himself.